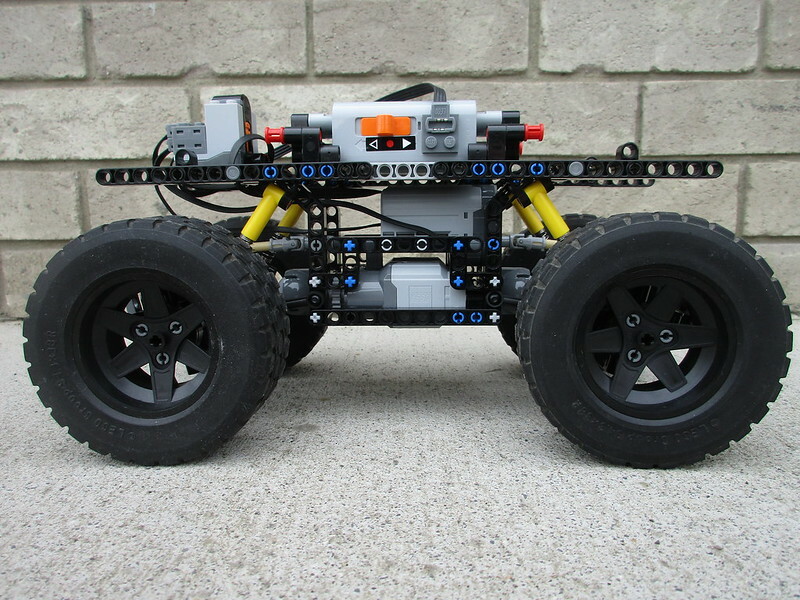 Today I present to you my latest build: a motorized monster truck, still unfinished. Now Finished! 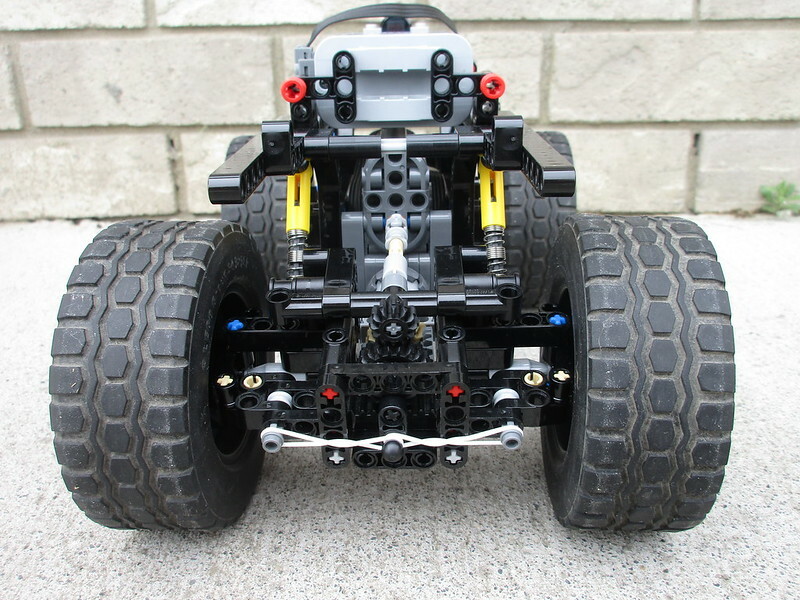 Crowkiller's excellent model is a manual 4x4x4 monster truck, with 5 link live axle suspension with diffs, a central differential, all-wheel HoG steering, a fake V8 connected to the drivetrain, and a detachable, and therefore, interchangeable, body. 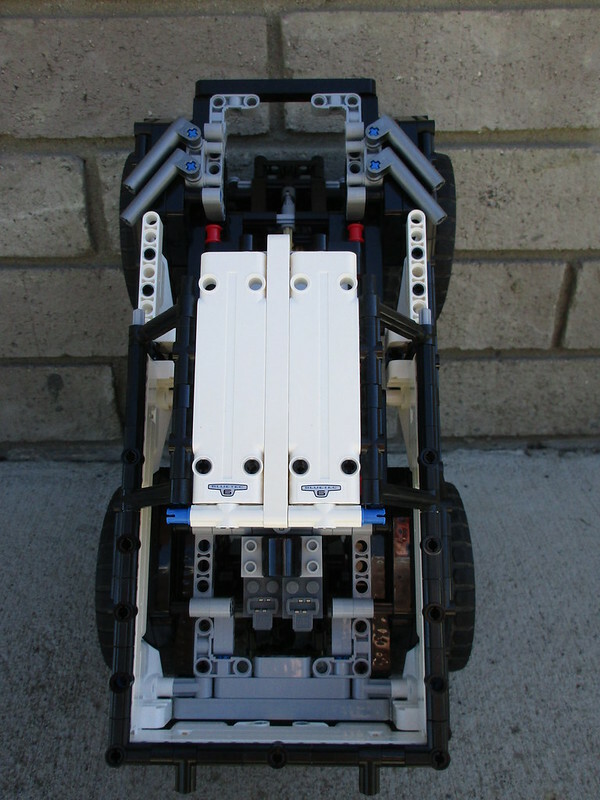 The chassis length was increased by two studs in order to accommodate the two L-motors used for driving. The suspension geometry remains the same, though I will probably have to use the hard shocks... A Servo motor was added to control steering, as well as a standard AA battery box and a V2 receiver. 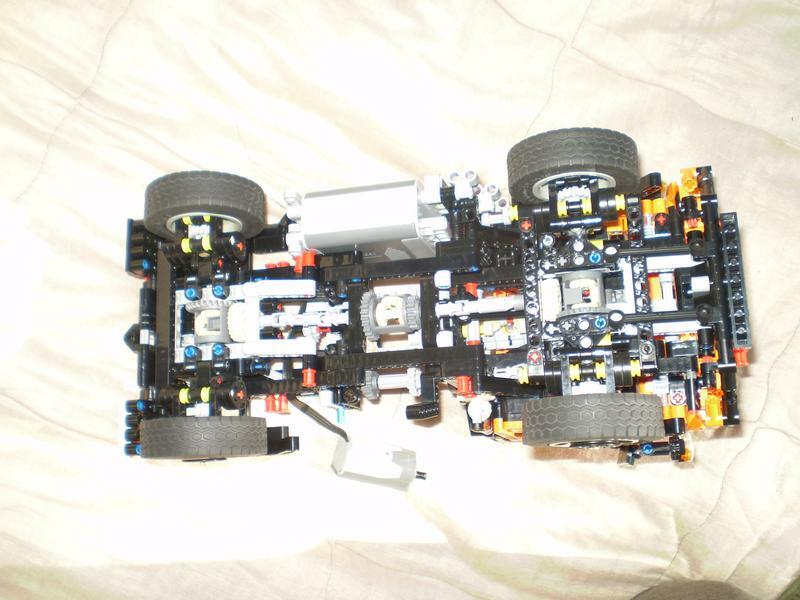 I wanted to keep the central differential, but it would have required the body to be too wide. 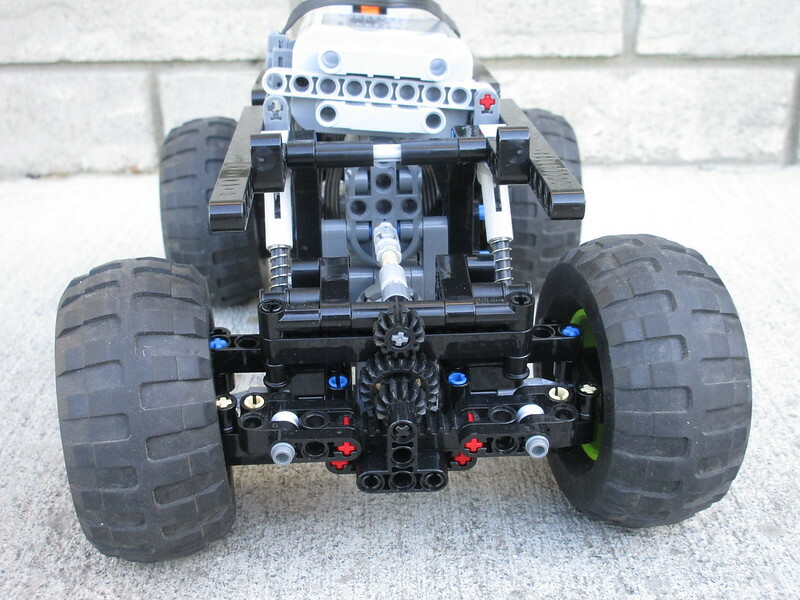 I also tried to incorporate the V8 engine, but the Servo motor and the steering shaft restrict the placement of gears to connect the fake V8 currently. 1. A body (or two, or three, or four). 2. Reinforcement of the steering. At the moment, if I crash into anything at speed, (which happens frequently ) the front portion of the axle will bend to the side where the impact occurred. Which is not good. What Is Finished: See below what has been done. Also, LDD file instructions are available here. The Model Is Now Finished! Free Instructions Are Now Available! Click Here! More photos and information is on Page 2! Thanks for looking, feel free to give your honest opinion (anything from "I love it!" to "Why the &%#@ are you copying other people's work?!" is acceptable ) and any advice you want to. Looks great. 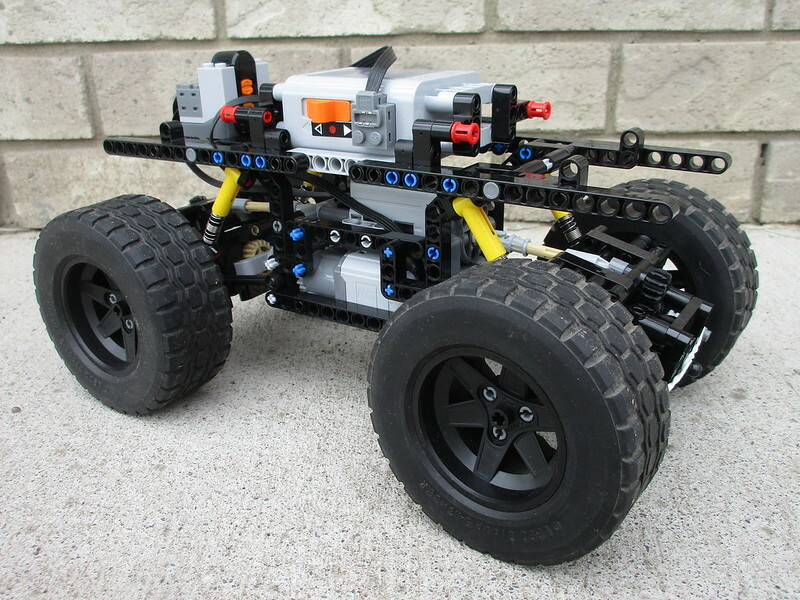 Can't wait to see the LDD so I can try it out. It looks interesting and very well balanced. 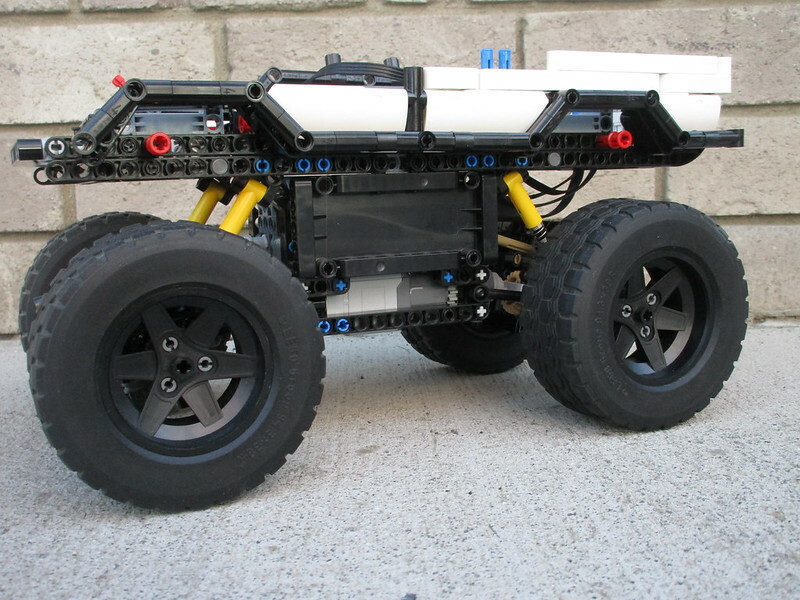 What body do you plan to install on chassis? 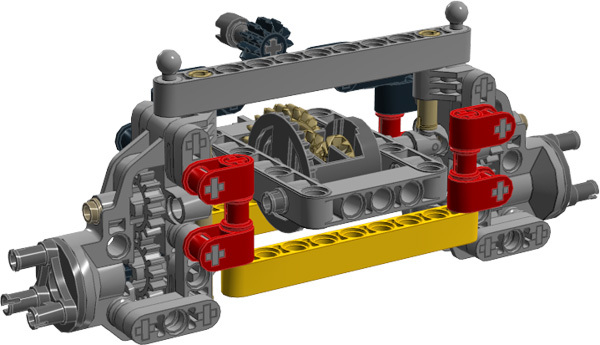 I'll have an update tomorrow, I need to finish fixing an issue with the axle bending out of shape when it crashes into something and add the change to an LDD file before I post that. @I_Igor Thanks, it is pretty well balanced, hasn't tipped over yet! No body yet, I was planning on some sort of truck-style body, maybe similar to a 2017 Ford Raptor. And maybe some sort of supercar body just for kicks. 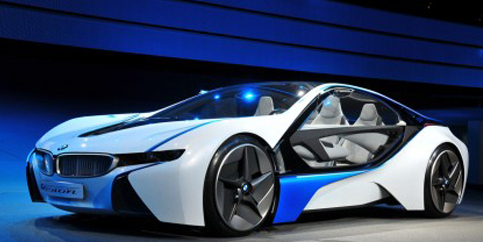 Maybe something like the BMW Z5 Concept. It was first shown in Mission Impossible 4, and I thought it looked awesome. However, I cannot build it full scale, I don't have the parts. Yeah, I'll try it with Unimog tires today. Hopefully they will fit. Photos and LDD coming later tonight! I don't know about that... I don't want to make it bigger. With a truck body, it should look fine. With Claas tires... Then a bigger chassis (and body) would be needed. Update time! 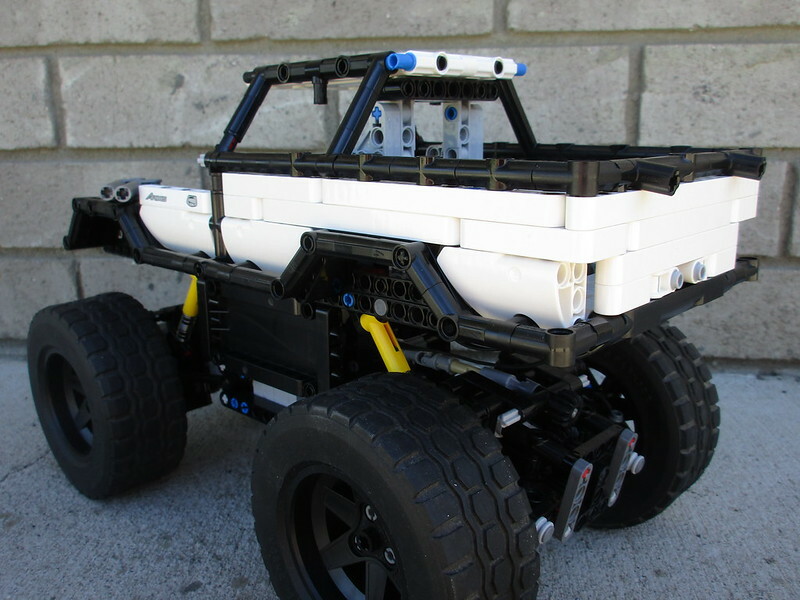 I have fixed the issues with the steering, both of flexing and of slack (for the most part... ). If any of you geniuses out there want to add something about eliminating slack, it would be greatly appreciated. I have added Unimog tires, instead of the 81mm tires. I must say, I think this looks a lot better. And they don't hit anything when steered! The white rubber bands were added to help control some of the slack, which works, but only to a certain extent. 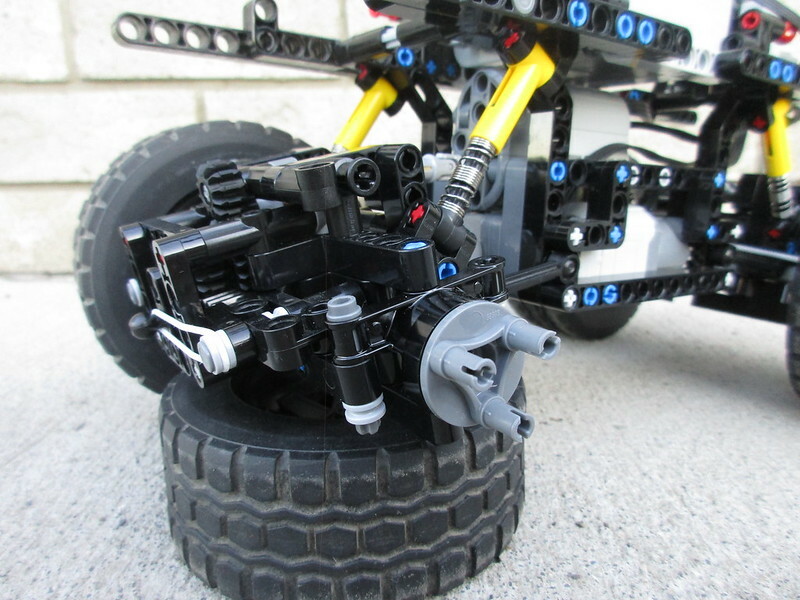 Also, I have the LDD file for the chassis here. Please feel free to give any advice, comments, or criticism you want. Thanks for looking! Thanks, Igor! I was already starting another axle with something like this, but there is so little space to do so... I'll try to finish it and get some photos up tonight. 1. 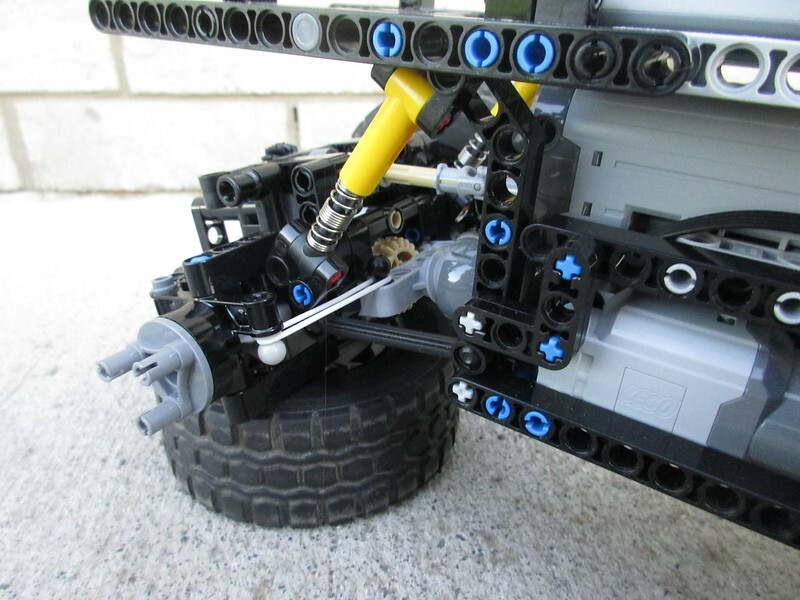 I have modified the axles so that there is a single tie rod now, which reduced some of the slack. I changed the rubber bands position to help with the remaining slack, but there is not much of a noticeable affect; the model still curves one way or the other while driving... Therefore, I will be removing them shortly... I don't know what else to do to reduce the slack (there is a LOT) because it results from needing to have the steering geared down... Any advice? 2. I will update the LDD file tomorrow. Sorry, not the best photo, but you can see the changes to the steering rod, as well as the front rubber band. Please give any advice, comments, criticism, etc. you want to. Thanks for looking! 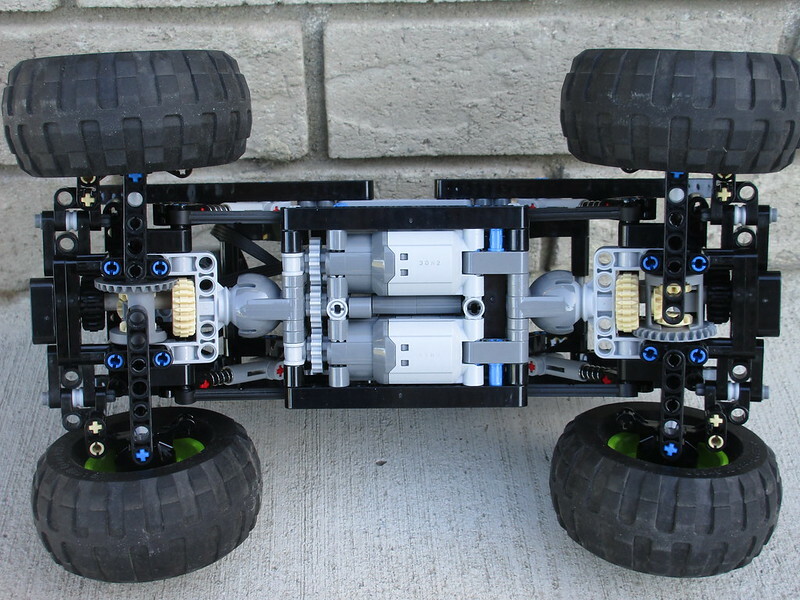 At this point, I don't plan on changing the axle design any more, it is still fun to drive, you just have to correct it once in a while... I am just gonna focus on the bodies for now. Today's Update! I have started the supercar bodywork, and it is coming along pretty good. So far, it is just a frame to figure out the size and shaping, but I figured out how to make the doors, I will use one of the Bionicle joints to make it open in this scale. For the blue streak, I have the small panel, and I will probably add some 3mm or pneumatic tubing to finish it. Photos will come tomorrow, I don't have a good light currently. Not to mention my camera battery is dead. @I_Igor You are welcome to mod my monster truck in any way, feel free to post the changes here, or you can PM me whatever changes you make, if you want to share them. I will happily brainstorm over the weekend on this issue, but that may fit better in the Axle Collection Thread than in this topic for the moment. A Small Update: More will come later, but for now, I have updated the LDD file. 1. I apologize for not keeping this thread updated over the last 2 weeks. I was busy job-hunting, but I did successfully land a job, so I have time to continue this project! 2. I will have some photos up later tonight of the truck body, but because of some real-life car troubles, I no longer have funding for the parts I would need for my planned supercar body. Maybe in the future! 3. An LDD file for this body has been started and is being updated as I build, I hope to make it availible later this week! Congrats on New job! Good to hear you still have time to build in your hobby. 1. The body: It is gonna be a bit more Jeep-like in shape than I had wanted, but it looks good so far, IMO... What do you guys think? 2. LDD: The LDD file is in progress, I will upload it as soon as I can, hopefully by Wednesday. 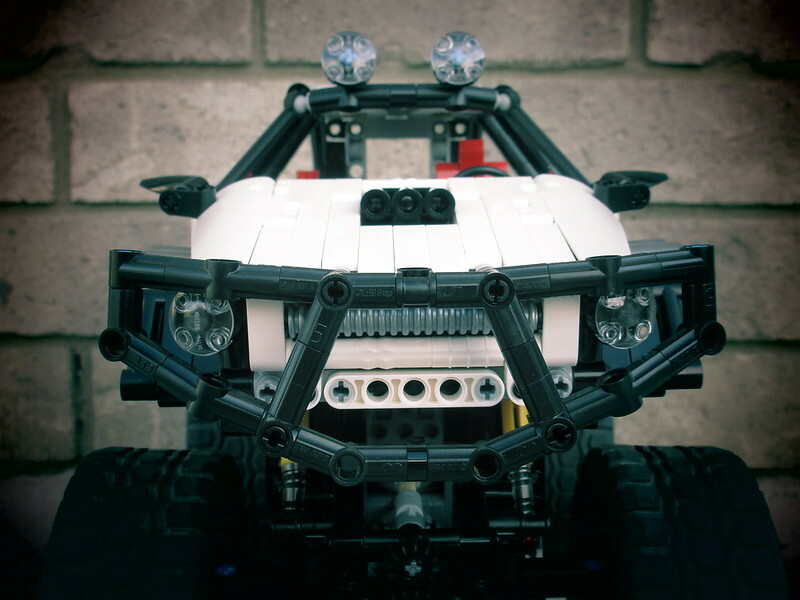 @Aventador2004 I will ALWAYS have time for Lego! More coming soon! Please give C&C! Thanks! 1. 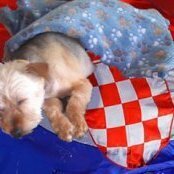 An apology: I am very sorry, I have not updated this thread for the last two weeks. So I will remedy that issue. 2. The body: It is almost finished! Just the hood, lights, grill and bumper are left. And a bit of the rollcage. Hopefully within a few days it will be complete. 3. 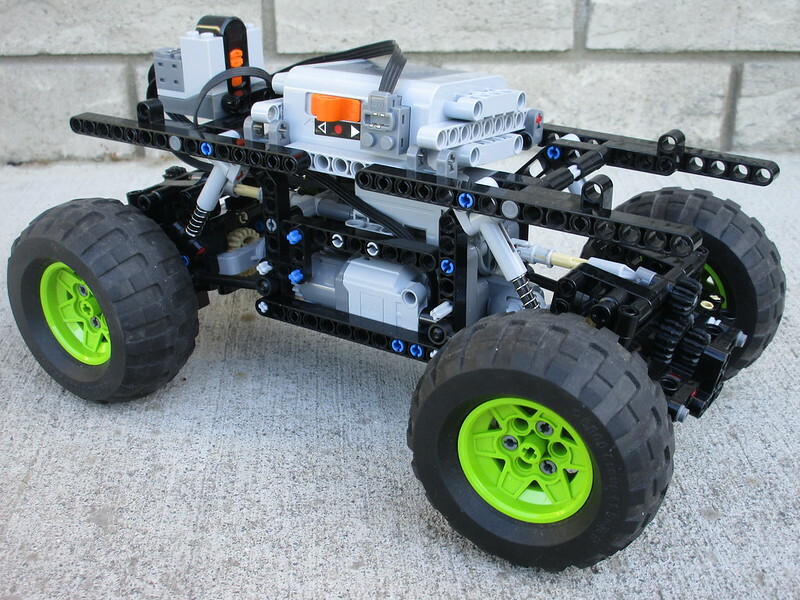 The LDD: The bodywork file is updated to the current, but incomplete body. I will update it once the body has been finished. The files are here. The back is the most finished part, but there will be bars between the roof and rear. Top view is just another perspective to show the shaping. Another update will come tomorrow or Tuesday! Please give C&C, and thanks for looking! I like it - it looks nice and solid. Looking forward to a video. (Oh, and as a lover of everything Tuscan, I think that "Leonardo da Bricki" is the coolest nickname ever). It is really solid and quite sturdy. And I plan to reinforce it still more. 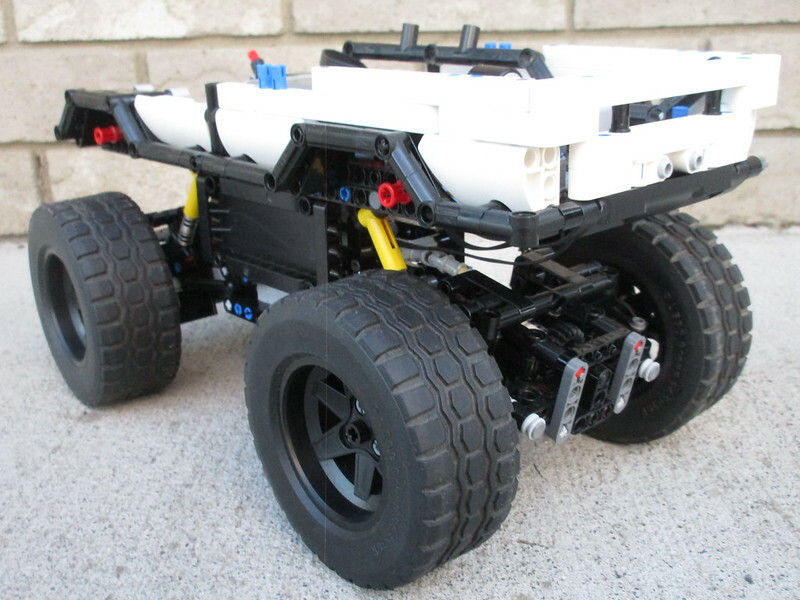 I may make a video of the chassis this week, and hopefully, one of the finished model later next week. Thank you, I am rather proud of thinking it up!